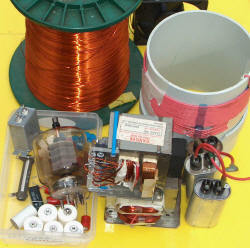 Details of this driver driving flyback and other coils are here. 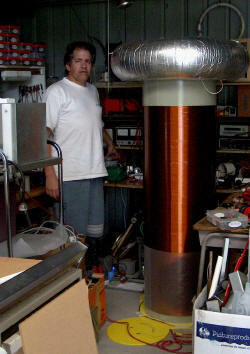 Here it is used with a 1+1 turn primary on the base of my 18 inch coil. This is a proof of principle coil rather than a big performer. It uses SIDAC's in place of a spark gap (As I use them which is with the tank cap across the supply rather than the spark gap across the supply). These are symmetrical breakdown devices. As set up at present it is driven by a MOT transformer with the associated 11kV diode and 0.95 uF 2KVAC cap wired as a voltage doubler to provide 5.6 KV or so. This is dumped by a SIDAC or rather 22 in series each shunted by 1 megOhm. Each SIDAC is rated to breakdown at 240V and has a 1A RMS or 20A pulse capacity. The string of 22 SIDAC's will nominally breakdown at 5280V. 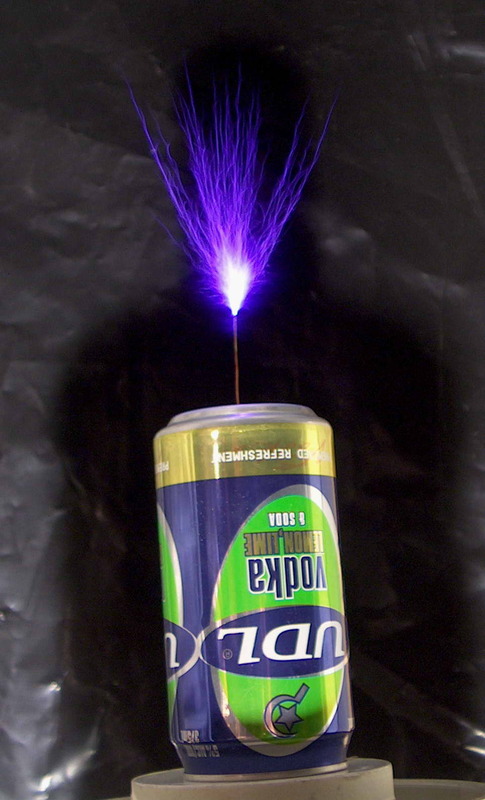 SIDAC's act similarly to a sparkgap. Data is here. The SIDAC's cost US$1.33 each in 10 quantity at Digikey. Also shown running ignition coils (with much better performance) here. This might have application for small coils running low voltages where spark gaps become problematic, but without the complexity of an SSTC. 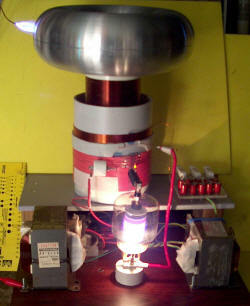 Pic shows 2 inch sparks on my 4 inch coil (5 kV in 60kV out). I later used 47 SIDAC's each shunted with 1M . I could get small streamers but not much more regular spark length. However, if I used a spark gap in series with the SIDAC's the spark length increase was marked and over 6 inches. I interpret this to indicate that quenching is not really happening with the SIDAC's alone possibly due to the speed of the devices. I had hoped the SIDAC's recovery when the current drops would do this but apparently not well or fast enough. Di/dt is 120A/uS. 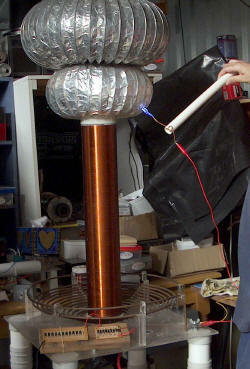 This is a version of a Tesla coil where the primary is driven by a vacuum tube (valve) oscillator. 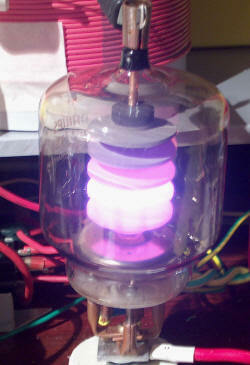 I have a Philips TB3/750 power triode rated at 3 kV 1 kW with a 5 V 14 A filament. 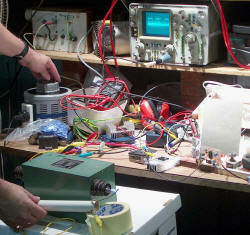 The high voltage comes from a microwave oven transformer (MOT) and doubler. The filament supply is from a rewound microwave oven transformer to give the 5 V. This is largely a copy of Steve Ward's VTTC modified to use parts I had on hand. 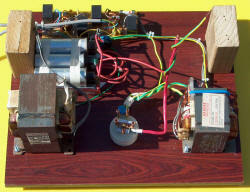 Above left shows Steve Ward's circuit diagram. The 833A valve is a bit more powerful then the one I have. Above right shows the parts scrounged from my shed. I haven't had to buy anything specifically for the coil at this stage. I was donated this and some other valves by Prof. David Blair (Physics, Uni of Western Australia). Above left shows the base of the VTTC. 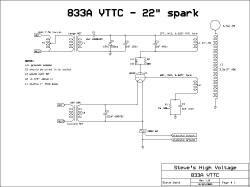 Left MOT is for the main HV with a diode voltage doubler using one of the 3 MO capacitors. Right MOT is the filament supply. Vacuum tube socket is front centre and MO suppression filters at rear for each of the two MOT's. Centre photo shows an early shot in action. This is not in tune and is only using a single 440 pf tank capacitor instead of the 5 I would need to get around 2000 pF (= 2 nF). This allows the rather small secondary coil to run with a relatively large toroid (the only one I have that looks decent close up). Right photo shows the tube glowing a bright orange. In this setup it is very inefficient. A further step along the way. Still not in tune but with streamers up to 4 inches. Frequency is about 300kHz but with a 2MHz harmonic. I have a 12 inch secondary with about 750 turns of 26g. No staccato yet but I have the parts. 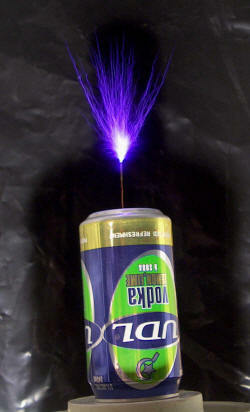 Photo shows a drinking man's toroid and some sword like streamers. Vacuum tube is not red (well, for short runs at least). Pic shown full on running one half of an NST. You should be able to follow the wiring setup from the photo Yes I am turning an "old fashioned" variac but just to supply power to the setup. 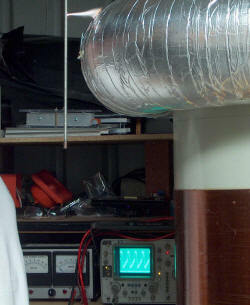 I don't really think that it would be more expensive than a variac for NST use of less than 5A 240V. The main rectifier could be 3A diodes, and the IGBT/Mosfet could be almost any one with a 500V rating at 10A. The TL494 circuit could be a 555 in this situation. The snubber may generate some heat and a mains filter is probably wise. A small 12V transformer or even old 9V plugpack could supply power. As ususal it depends how much can be scrounged up. If this can be made to work reliably and effectively then it may be of interest to those who use NST's.